It has always been the aim of the Professional Bodies of Reflexology to encourage and maintain the highest standards of work practices. This is evident in the Training and Code of Ethics. 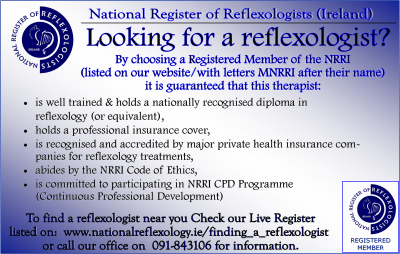 Now might be a good time to revise the Code of Ethics as outlined by the National Register of Reflexologists (Ireland). These standards need to be constantly revisited according to the needs of our time. It is in this context that a draft syllabus for a Higher Certificate in Reflexology has been submitted by the NRRI at an educational Level 6 to HETAC (Higher Education and Training Awards Council). A Research Forum has also been set up to establish a Data Base and a Methodology for compiling research from case studies. Members need (CPD) Continuing Professional Development points in order to avail of new information regarding different aspects and an understanding of Reflexology. CPD points are also needed to renew and maintain membership. These workshops also provide support and friendship for members. Reflexology can be a lonely practice for the therapist, and it is helpful to have a network of friends to consult with. It is heartening to realise that the Health Insurance Companies, VHI, Vivas and Quinn Direct have recognised the value of the therapy and are providing some cover for their members. • Constantly upgrade and researching working knowledge of Anatomy and Physiology. • Knowledge from Researching Medical Conditions can assist in optimum use of Direct and Helper Reflexes. • Constant awareness of Contra Indications and Cautions. New conditions may arise. • Evaluate appropriate action to be taken with regard to adverse reactions during, and after treatments. • Create a clean warm working environment with an atmosphere of sympathy and understanding towards client. • A brief explanation of the therapy to client on first visit is helpful. • Client confidentiality and support an integral part of the therapy. • Accurate note taking is essential for ongoing reference and evaluation of effectiveness of treatments. • Old or suppressed conditions and emotions may be revisited during client healing process. • Receipts for Health Insurance Companies should include Therapist's Name, Address etc. • These will also help balance accounts. • Boundaries and limitations are an integral part of the therapy. • Evaluation of client's progress and the efficacy and appropriateness and of the treatment should be ongoing. In this context refer to client's medical practitioner or caregiver if necessary. • It is not appropriate to offer unsolicited advice. • It is essential that therapists look after their own health and wellbeing. It would be helpful if members could suggest additions to this list. We are all members of this Professional Body, and it is essential that we keep standards at the highest level by constantly re-evaluating ourselves and our method of practice.